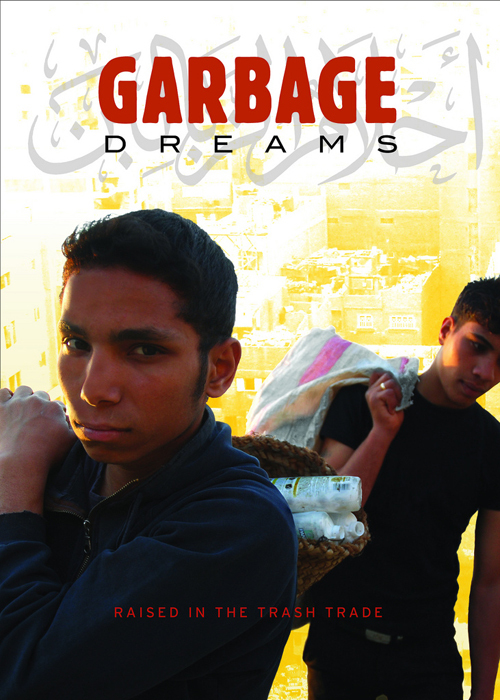 GARBAGE DREAMS follows three teenage boys born into the trash trade and growing up in the world’s largest garbage village, on the outskirts of Cairo. It is home to 60,000 Zaballeen (or Zabbaleen), Arabic for “garbage people.” Far ahead of any modern “Green” initiatives, the Zaballeen survive by recycling 80% of the garbage they collect. Face to face with the globalization of their trade, each of the teenage boys is forced to make choices that will impact his future and the survival of his community. For generations, the residents of Cairo have depended on the Zaballeen to collect their trash, paying them only a minimal amount for their garbage collection services. The Zaballeen survive by recycling the city’s waste. These entrepreneurial garbage workers recycle 80% of all the garbage they collect, creating what is arguably the world’s most efficient waste disposal system. When the city they keep clean suddenly decides to replace the Zaballeen with multinational garbage disposal companies, the Zaballeen community finds itself at a crossroads. Face to face with the globalization of their trade, each of the teenage boys is forced to make choices that will impact his future and the survival of his community. With a population of 18 million, Cairo, the largest city in the Middle East and Africa, has no sanitation service. For generations, the city’s residents have relied on 60,000 Zaballeen, or “garbage people,” to pick up their trash. The Zaballeen collect over 3,000 tons a day of garbage and bring it back to their “garbage village,” the world’s most effective and successful recycling program. Paid only a minimal amount by residents for their garbage collection services, the Zaballeen survive by recycling. They have transformed Mokattam, their garbage neighborhood, into a busy recycling and trading enclave. Plastic granulators, cloth-grinders and paper and cardboard compacters hum constantly. While Western cities would boast of a 30% recycling rate, the Zaballeen recycle 80% of all the waste they collect. The Zaballeen, who mostly belong to Egypt’s minority Coptic Christian community, were originally poor and illiterate farm laborers. Driven out of the rural south due to a lack of work, these disadvantaged farmers saw Cairo’s trash as an economic opportunity. They have created a recycling model that costs the state nothing, recycles so much waste and employs tens of thousands of Cairo’s poorest. The Zaballeen earn little, but in a country where almost half of the population survives on less than $2 a day, it is a livelihood. Or has been. In 2005, following the international trend to privatize services, the city of Cairo sold $50 million in annual contracts to three private companies (two from Italy and one from Spain) to pick up Cairo’s garbage. Their giant waste trucks line the streets, but they are contractually obligated to recycle only 20% of what they collect, leaving the rest to rot in giant landfills. As foreign workers came in with waste trucks and began carting garbage to nearby landfills, 60,000 Zaballeen saw their way of life disappearing.